Do you guys remember the first time that you had beef stew? No, I don’t mean anything that came out of a can or white plastic package that was labeled Dinty Moore, Hungry Man or Campbell’s that you had to nuke inside a microwave. That doesn’t count here. 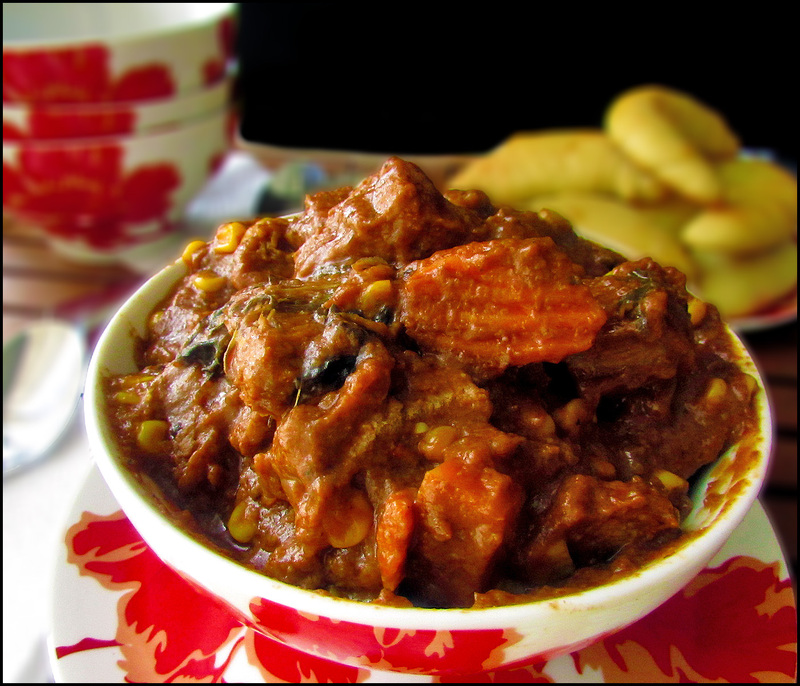 I mean, do you remember the last time you had real beef stew: a thick, rich, , hearty, completely homemade brew of tender meat and vegetables simmering on the stove that filled the house with an aroma that made everyone literally salivate with hunger? Does anyone remember when they first had stew like that? I sure remember the first time that I did. I was in my third year of undergrad at college, right before the time that I started to become interested in learning how to cook. Me and my sister (my roommate) had moved out of the dorms and into an apartment on campus. The dorm that we lived had for two years had recently been remodeled just our freshman year, including the cafeteria. We were very fortunate in that the food was not only edible, but pretty good for the most part. It spoiled us, to be honest. We didn’t realize just how much until we moved into our apartment without a cafeteria meal plan. It was…a learning experience. We learned that frozen chicken patties got old. As did the microwaveable dinners. We also found out that as college students, consistently ordering out at local restaurants and take-out joints was not economically sustainable. Something would have to be done. I reached out to my mom with our ‘desperate’ situation. Her maternal instincts were completely dependable and she immediately made it apart of her routine to cook homemade meals for her daughters on the weekends that we would pick up when we came home so that we wouldn’t have to eat processed crap or takeout all the time. My mom’s a fantastic cook. Really, truly fantastic. She made us a lot of big, bulk dishes that could either be really stretched out to last during the week, or frozen to eat later in the future. It was one week in the Spring that one of the things Jas and I got sent home with was a big pot of beef stew. I’d never had beef stew that wasn’t microwaveable before. But I had absolute confidence in my mom’s cooking and figured that anything she made had to be pretty good. Her beef stew wasn’t ‘pretty good’. It was absolutely incredible. 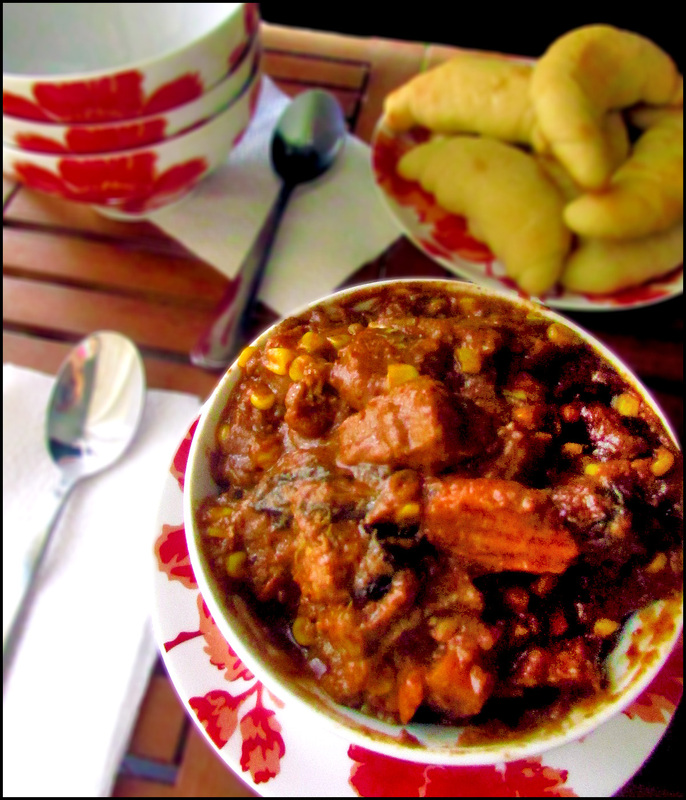 To this day, that stew is seriously one of the best tasting things I’ve ever put in my mouth. The blend of spices and seasonings was just perfect. It may seem weird, but I actually remember being jealous that my mom was able to produce something that tasted so good. It was the start of my wanting to be able to learn how to cook for myself. 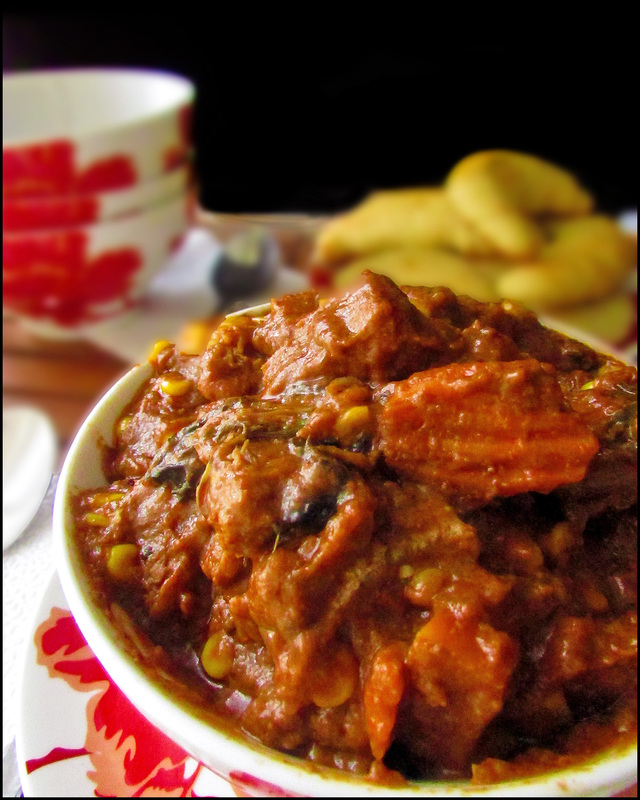 When I finally did get comfortable in the kitchen, I still remembered the taste of that beef stew. I wanted it again. Badly. So I asked my mom what she put in it. Which, you know, was loads of help. Nevertheless: I made it a personal goal of my kitchen aspirations to be able to replicate the taste of that beef stew my mom made me in college. I’m still trying to get it down to this day. Not to say that the ones I’ve tried aren’t good- everyone, including her, tells me that they are. But they juuuuuust aren’t quite as wonderful as my mom’s. This one though? It’s close. Not the same…but it is close. 1. Place flour in a plastic bag. Add meat cubes, a few at ta time, shaking to coat. 2. 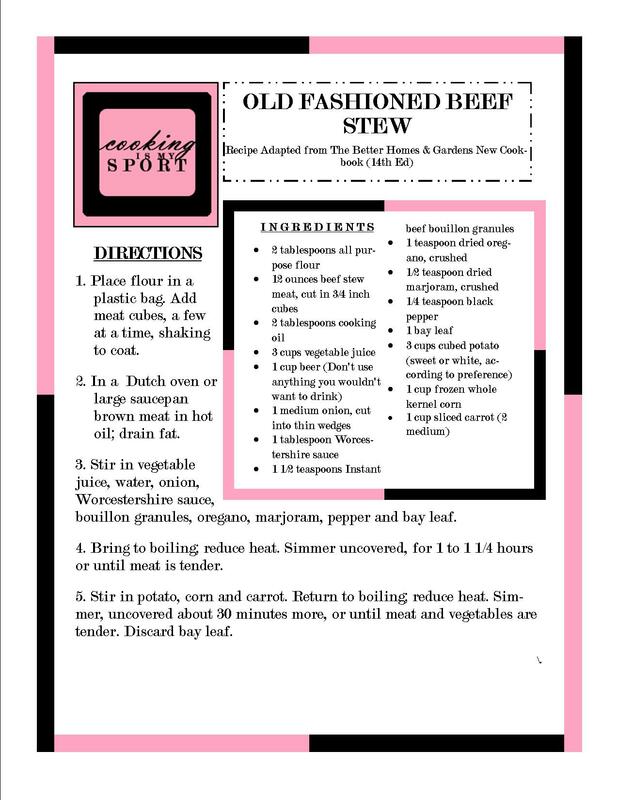 In a Dutch oven or large saucepan brown meat in hot oil; drain fat. 3. Stir in vegetable juice, water, onion, Worcestershire sauce, bouillon granules, oregano, marjoram, pepper and bay leaf. 4. Bring to boiling; reduce heat. Simmer uncovered, for 1 to 1 1/4 hours or until meat is tender. 5. Stir in potato, corn and carrot. Return to boiling; reduce heat. Simmer, uncovered about 30 minutes more, or until meat and vegetables are tender. Discard bay leaf. Thank you, it tastes even better! This was the cutest post, Jess. 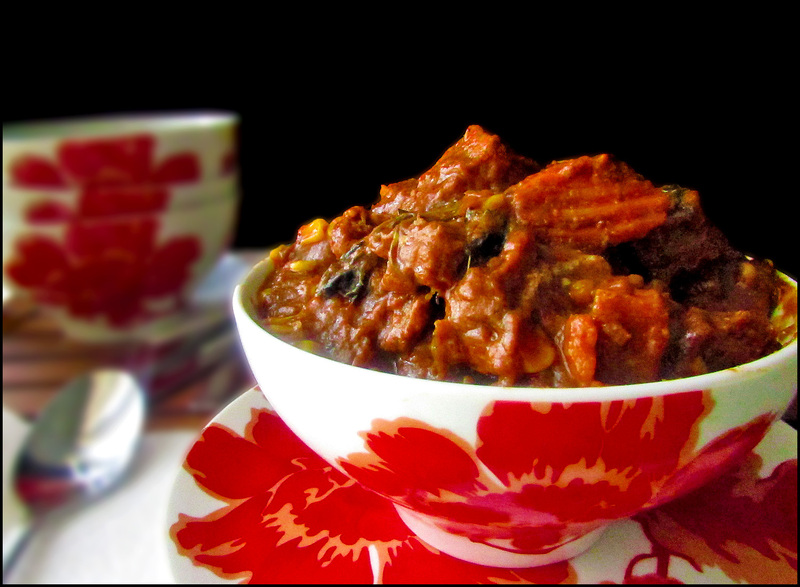 🙂 The stew is absolutely beautiful… I could eat the whole bowlful, and then ask for seconds!! I don’t remember the first time I had beef stew, because we used to have it all the time when I was little. We’re a big Irish Catholic family, and it was an easy and inexpensive thing for my mom to make in bulk. I love it now, but as a kid, I loathed it because there were a lot of overcooked carrots in that thing. Ah, thanks for the memories! Your version sounds great. Good luck getting it to match your mom’s version exactly! Haha, sure, anytime. I can promise that there won’t be any overcooked carrots in this one.